In October 2010 the U.S. Department of Education created a set of approval and reporting requirements for online programs in educational institutions. One of the regulations was 34 C.F.R. 600.9, which is commonly referred to as State Authorization. This regulation provided that institutions that offer online education outside of their home state must be authorized, licensed, or otherwise allowed to participate in states where their students are, even if the institution has no physical location there. This regulation has been on hold for the past few years as it has been challenged in federal court—however, institutions have been encouraged to continue to seek state authorizations as the courts continue to rule and the Department of Education considers its position. The University of North Alabama has been working toward getting authorization from all 50 states, and initial contact has been made with each one. Information on authorizations is on file in the Office of Online Education, Stevens Hall Room 103 A and may be obtained on request. On July 1, 2014, the State of Alabama officially became part of the Southern Regional Education Board’s Electronic Campus Regional Reciprocity Agreement (SECRRA). In accordance with this reciprocity agreement, institutions in Alabama (including the University of North Alabama) that offer academic programs which are delivered 100% online do not need to seek authorization from other SREB states to enroll students from those states as long as the academic programs are registered in the SREB’s electronic campus. SREB states in addition to Alabama include Arkansas, Delaware, Florida, Georgia, Kentucky, Louisiana, Maryland, Mississippi, North Carolina, Oklahoma, South Carolina, Tennessee, Texas, Virginia, and West Virginia. 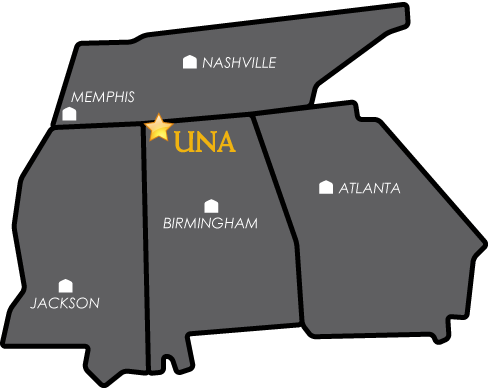 UNA is a member of Southern Regional Education Board's Electronic Campus. For more information about the Electronic Campus, please visit https://www.sreb.org/electronic-campus.